The Architectural League of New York’s Emerging Voices award and lecture series highlights individuals and firms with distinct design “voices”, singling out those with the potential to go on to even greater heights. 2018 saw two rounds of judging; first by a panel of past Emerging Voices winners, and a second to pick the winners. The first-round jury included Virginia San Fratello, Sebastian Schmaling, Wonne Ickx, Lola Sheppard, Marcelo Spina, Carlos Jimenez, and Marlon Blackwell, as well as members of the second-round jury, Sunil Bald, Lisa Gray, Stella Betts, Jing Liu, Paul Makovsky, Tom Phifer, Chris Reed, and Billie Tsien. AN profiled all of the emerging voices firms in our February print issue. Comunal: Taller de Arquitectura founders Jesica Amescua and Mariana Ordóñez Grajales will deliver their lecture on March 15, 2018, at the SVA Theatre in Manhattan. Since establishing their practice in 2015, Mariana Ordóñez Grajales and Jesica Amescua, of Mexico City–based Comunal: Taller de Arquitectura, have continually worked to push the limits of their socially guided architectural practice and the architecture and building that result from it. The practice combines academically minded research with materials engineering and community-led participatory design and construction to generate new forms of vernacular architecture in rural communities. “Our work begins with a social feasibility study,” Ordóñez explained. “We analyze and understand the capacity, willingness, and degree of organization that a community has to face difficulties. Then, we carry out the processes of research, social management, participatory design methodology, and finally, construction itself.” For the architects, the true power of their profession lies in their ability to facilitate the culturally appropriate material improvement of these glossed-over rural communities, as evidenced by the firm’s work on a series of childbirth centers across Tenejapa Municipality, in the Mexican state of Chiapas. Comunal partnered with a group of local midwives to conceptualize a network of pitched clapboard structures that will help the delivery nurses formalize their practices and achieve their goal of eliminating infant and maternal mortality in the region. Through built projects and academic research, the office also works to stave off the modernizing—and standardizing—effects of market forces and government regulation, which can produce alienating, short-lived structures and can often disincentivize the use of trusted materials like bamboo and thatch. In a recent project, for Mexican social housing developer Infonavit, created in partnership with Mexico City-based architects Escobedo Soliz, Comunal helped create a courtyard home prototype built from these traditional materials. 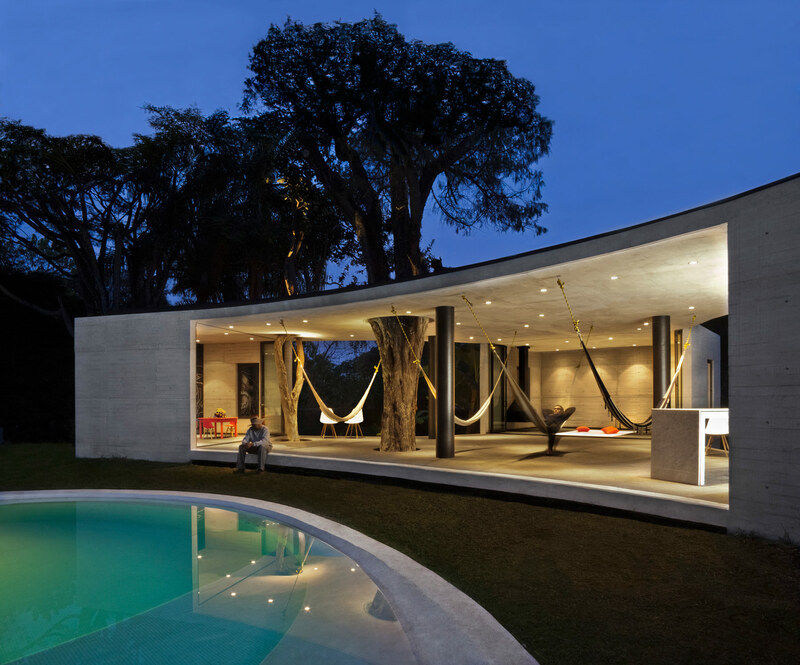 The vivendas are defined on one end by a home capped with a steeply raked roof that conceals a double-height interior volume containing a loft and the sleeping hammocks that are customary in the region. The courtyard complex is designed for passive ventilation and is erected out of running bonds of offset, buff-colored concrete block, with stone foundations. An indoor-outdoor kitchen sits opposite the lofted space, with a generous patio sandwiched in between. Amescua said, “Vernacular architecture poses a close link and a constant dialogue with the territory, where the symbiosis between it and the inhabitant becomes evident not only in the form and functioning of the architectural objects but in the way in which elements are grouped.” Working with traditional materials and construction techniques fueled Comunal’s approach for another social housing project, from 2013, with Unión de Cooperativas Tosepan Titataniske, a cooperative made up of indigenous communities in the state of Puebla. In this project, the designers pushed to incorporate bamboo construction in ways that would still allow regulators from the state to approve— and potentially fund—the project. 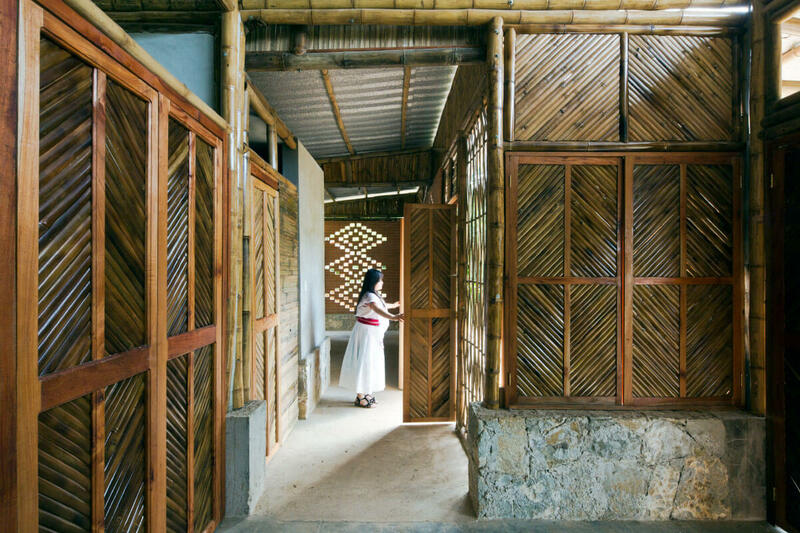 For the development, Comunal and local partners developed a set of modular infill panels and roof trusses that sit on or between concrete-block walls and bamboo piers buttressed by intricate brickwork. The wall panels utilize bamboo and cementitious materials alternatively, depending on functional need, while the corrugated metal panel roof is designed to facilitate rainwater capture on site. Lessons gleaned from the project were implemented in a 2016 effort in the same area that utilizes a primary set of concrete posts and beams for structure instead of bamboo. The social housing project was recognized in November 2016 with a silver medal in Mexico’s National Housing Commission’s First National Rural Housing Contest and has led to new work with the organization. The Architectural League of New York’s Emerging Voices award and lecture series highlights individuals and firms with distinct design “voices”, singling out those with the potential to go on to even greater heights. 2018 saw two rounds of judging; first by a panel of past Emerging Voices winners, and a second to pick the winners. The first-round jury included Virginia San Fratello, Sebastian Schmaling, Wonne Ickx, Lola Sheppard, Marcelo Spina, Carlos Jimenez, and Marlon Blackwell, as well as members of the second-round jury, Sunil Bald, Lisa Gray, Stella Betts, Jing Liu, Paul Makovsky, Tom Phifer, Chris Reed, and Billie Tsien. AN profiled all of the emerging voices firms in our February print issue. Modus Studio founder Chris Baribeau will deliver his lecture on March 1st, 2018, at the SVA Theatre in Manhattan. Modus Studio might have started in 2008 as a two-man operation in cofounder Chris Baribeau’s back office, but the firm’s expansion to 24 people and a full fabrication shop shouldn’t have come as a surprise. The office’s intensive focus on the surrounding Arkansas environment and their hands-on approach have drawn attention both inside and outside of the state. “A thinking–making philosophy really evolved out of our passions, from working through college, working on construction, working on fabrication,” explained Baribeau. “It set the tone for the rest of our professional work.” Modus is a frequent collaborator with the University of Arkansas and has designed for the school a pair of mass timber residence halls, an athletic area master plan, and, most recently, a sculpture studio— although the firm has realized nearly every type of project. 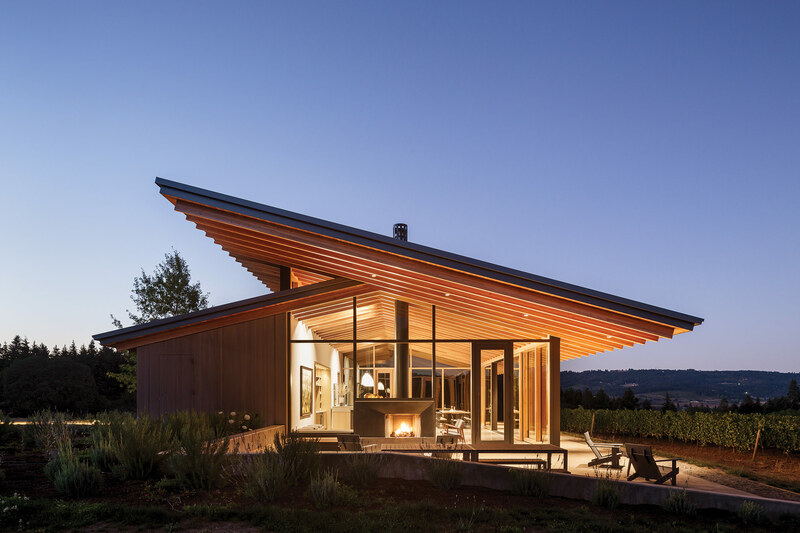 Its single-family homes typically draw on the surrounding geographies and ecosystems to influence the final forms, as is the case with Van Huset on the Bluff, a stark cabin overlooking Beaver Lake, in northwest Arkansas. Educational work has a special place in the studio’s canon. 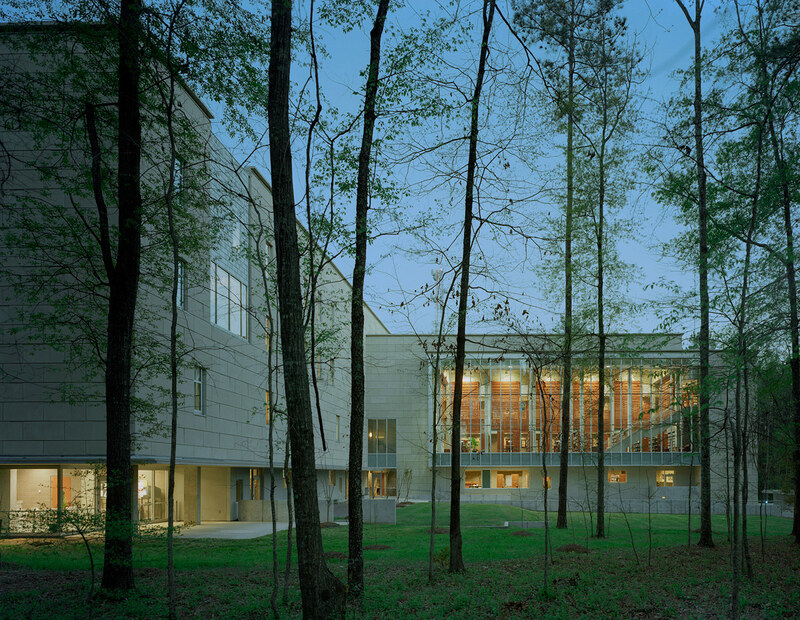 Green Forest Middle School, Modus’s first project, was also the first school that either Baribeau or cofounder Josh Siebert had ever worked on. Having to leap into a new building typology meant engaging heavily with the community at every step of the school’s design and construction, an approach that has carried over to all of their projects afterward. Timber and sustainability are prominent through-lines in many of Modus’s built works, no matter the intended use. Working with timber allows the studio to harvest wood directly from the trees on-site, or if they’re not able to do so, connect with Arkansas’s timber industry. Even Modus’s Fayetteville office, a reclaimed warehouse clad in timber that was charred in the fabrication shop, is winning notice, as it was Arkansas’s only LEED Platinum– certified building in 2017. “We’re very connected to the natural world,” said Baribeau. “And being in the Ozarks, the language of the rugged mountains and valleys and rivers connects us to the outdoor world. We’re straddling this dynamic place that’s somewhere between the manmade and the natural world. Our buildings are about fitting into the landscape and drawing inspiration from the context around the site.” Modus views its location outside of the “major design cities” as a boon. Arkansas is in the process of rebuilding and infilling its urban centers, providing the studio an opportunity to experiment while allowing them to build their brand through projects that serve the community. 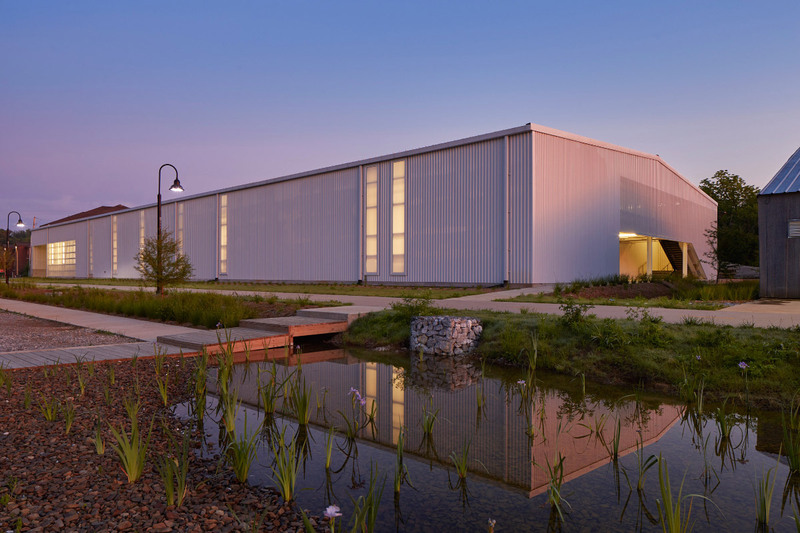 While Modus has begun working on projects as far north as Illinois, Baribeau is most proud of the K–12 schools that the studio has designed for low-income, rural areas. “We’ve found, particularly in this region of Arkansas, how rural communities are really underserved in terms of good design. The hub of that community, their tax money, the local football team, all focuses around the public school. For us, the ongoing tilling of the soil is to raise the bar for rural communities." The Architectural League of New York’s Emerging Voices award and lecture series highlights individuals and firms with distinct design “voices”, singling out those with the potential to go on to even greater heights. 2018 saw two rounds of judging; first by a panel of past Emerging Voices winners, and a second to pick the winners. The first-round jury included Virginia San Fratello, Sebastian Schmaling, Wonne Ickx, Lola Sheppard, Marcelo Spina, Carlos Jimenez, and Marlon Blackwell, as well as members of the second-round jury, Sunil Bald, Lisa Gray, Stella Betts, Jing Liu, Paul Makovsky, Tom Phifer, Chris Reed, and Billie Tsien. AN originally profiled all of the emerging voices firms in our February print issue. AGENCY founders Ersela Kripa and Stephen Mueller will deliver their lecture on March 8, 2018, at the SVA Theatre in Manhattan. Ersela Kripa and Stephen Mueller started AGENCY to consider the margins of the world. “We use our architectural training to uncover the shrinking of individual agency in public space and the reduction of human rights or potential human rights violations,” Kripa said. Working out of El Paso, Texas, the pair deploys words, maps, wearables, and installations to uncover contradictions in liminal spaces like military training sites, refugee camps, and borders—especially the one between the United States and Mexico. The architects completed their first project as AGENCY in 2008. A decade later, the firm continues to be defined by deep research into contested urban spaces and humans’ relationships to environments, built and digital, that are increasingly designed to collect personal data and monitor people’s actions without their consent. Kripa and Mueller, both instructors at Texas Tech University College of Architecture – El Paso, wound up in the city after a research visit for their forthcoming book, Fronts: Security and the Developing World. They were studying military training environments, like Playas, New Mexico—a village of hundreds of empty homes the U.S. Department of Homeland Security uses for counter-terrorism training. Increasingly, these simulated spaces feature shantytowns and junkyards, informal typologies associated with the developing world. AGENCY, Mueller said, believes these are both a “preamble to where the U.S. military can engage in the future” as well as a reflection of state attitudes toward public space in the contemporary city. Along similar lines of inquiry, the duo writes "Border Dispatches," a series for AN that explores these and other expressions of militarism along the U.S.-Mexico border. These are worthy topics, but are they architecture? AGENCY believes its designs could not manifest without the deep research it conducts. “In our built work, we start with intensive research and problem identification, where we proactively uncover hidden or emerging realities that are just beneath the surface of contemporary urban space,” Mueller said. “We try to imagine a scenario that can be inflected by designed objects or spaces that have a discreet presence.” The approach is apparent in Selfie Wall – A Public Sphere for Private Data,¹ a subversion of the made-for-Instagram interiors that trend online. 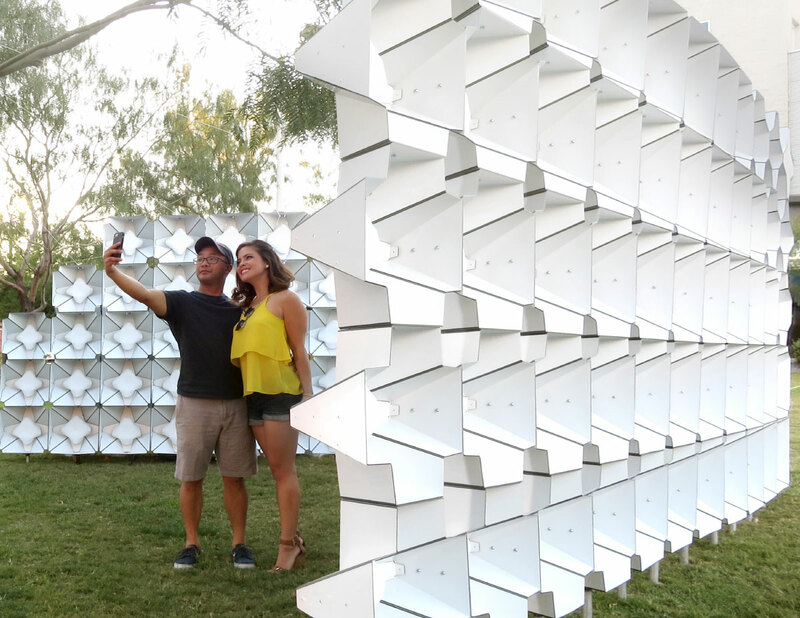 For El Paso’s annual art fair, Kripa and Mueller fashioned the ideal selfie sphere from 162 units of CNC-milled composite aluminum panels that diffuse soft LED light. The pair asked visitors to hashtag their photos from the installation so they could be collected and tracked. “People were very on board with hashtagging selfies so we could collect them,” Kripa said. “That was surprising.” AGENCY may remake Selfie Wall in Juarez, the Mexican city right across from El Paso, with an eye toward connecting people on both sides of the border. Design, they believe, can—and should—be deployed to control data, as well. For Delta Fabrics – Air Pollution Data Mapping,² a project executed during the 2017 Shenzhen Bi-City Biennale of Urbanism\Architecture, the pair walked the border between Hong Kong and Shenzhen with Arduino sensors to monitor air quality. The region’s air is cleaner than it was in the past, but it’s sometimes hard to tell what pollutants still linger, as the Chinese government often releases inaccurate data. To empower people with knowledge about the air they breathe, Kripa and Mueller are looking to mass-produce the sensors and distribute them to residents, who can then track air quality throughout their day. This should be a busy year for AGENCY. At home, Kripa and Mueller are working with a local entrepreneur to adaptively reuse a warehouse site, transforming it into a kitchen incubator and outdoor public market. Fronts is coming out this fall, and after that, the duo is scaling up the Delta Fabrics project. “We want to dive deeper into understanding how to democratize data so [people can] measure their own environment on their own, to take back agency a little bit,” Kripa said. The Architect’s Newspaper featured the Emerging Voices firms in our February issue; stay tuned as we upload those articles to our website over the coming weeks. New Orleans–based OJT's Founder Jonathan Tate will deliver his lecture on March 23, 2017, at The Architecture League in New York City. Click here to learn more! OJT is making waves in New Orleans with research-based work that redefines overlooked and undervalued properties. Founder Jonathan Tate is an Auburn graduate who experienced the Rural Studio under Samuel Mockbee and spent 10 years in Memphis working for Buildingstudio (formerly Mockbee/Coker Architects). After a sabbatical to study at Harvard, he relocated with the firm to New Orleans in 2008 and started OJT a few years later. “New Orleans just felt like the right place to be. We really cared about what was happening post-Katrina,” he said. OJT is committed to applying scholarly methods to professional practice. 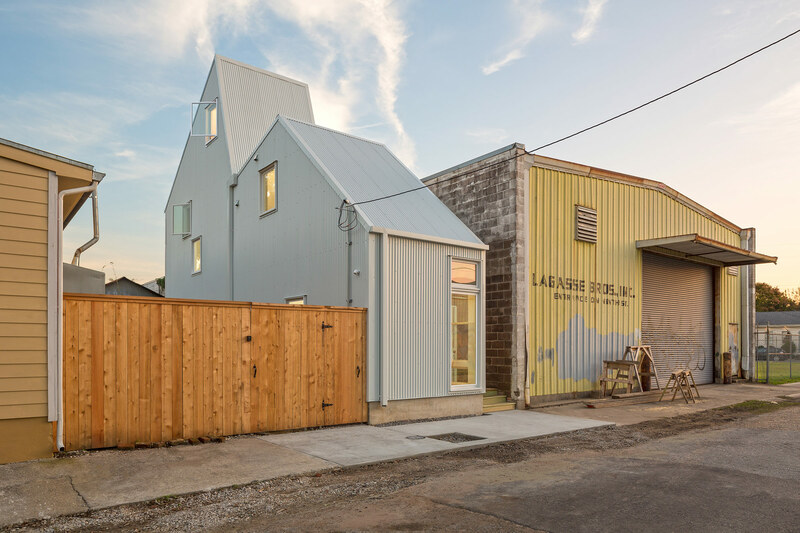 The seven-person firm’s portfolio comprises architecture and planning work as well as self-initiated research, like mapping nonconforming properties in New Orleans. This odd lot of odd lots helped kickstart the firm’s Starter Home* project, a development strategy to build modern, speculative infill housing aimed at first-time buyers. The prototype Starter Home*, located at 3106 St. Thomas Street, is shaped by the limitations of its 16-and-half-foot-wide lot and historic setting. The metal-clad building riffs on vernacular forms and uses the allowable 40-foot height to make its narrow spaces feel large. It’s become a model for development in New Orleans, and Tate hopes to apply it to other cities. But he’s quick to point out that OJT isn’t a developer. “Development is a tool for us to continue to explore an idea, and to illustrate imaginative ways to work within rules and regulations,” he explained. That desire also drives the Zimple house, built for the client’s father after he was diagnosed with dementia. Its clear sequence of spaces and central courtyard, which functions as a visual anchor, is informed by the firm’s research into the effects of memory loss. Located next to the client’s traditional camelback house, the project inverts the vernacular type to balance privacy and openness between the homes. The Architect’s Newspaper featured the Emerging Voices firms in our February issue; stay tuned as we upload those articles to our website over the coming weeks. The firm featured below (Portland, Oregon–based LEVER Architecture) will deliver its lecture on March 16, 2017, at The Architecture League in New York City. Click here to learn more! Architect Thomas Robinson kick-started his career with Joseph Esherick, the architect best known for designing the Hedgerow Houses at Sea Ranch, California, followed by stints leading institutional and cultural projects at Herzog & de Meuron in Switzerland and Allied Works in Oregon. In 2009, Robinson, a graduate of UC Berkeley and later Harvard (studying under Peter Zumthor), decided to branch out on his own, launching LEVER Architecture from his Portland basement. Over the past eight years, his firm has grown to 18 employees. A winner of the USDA’s U.S. Tall Wood Building Prize, LEVER Architecture has found a niche working with cross-laminated timber (CLT). “Timber is often hidden away,” Robinson said. “We want [timber] to be part of a greater architectural experience.” While mass timber construction isn’t new—according to Robinson it has been around since the 1930s—there is a rediscovering and understanding of the technology coupled with modern advances in fire safety, seismic engineering, and acoustics that has made it more feasible. LEVER Architecture is currently working on a 90,000-square-foot, 12-story CLT high-rise in Portland. The project, Framework, incorporates a wood-core structure. When completed in 2018, it is expected to be the first mass-timber high-rise in the United States. The design relies on a post-tension CLT rocking wall, which, as Robinson explained, is a resilient low-damage design that takes advantage of the lightness and strength of wood. “Wood moves and can re-center itself,” he said. Other recent LEVER projects also feature mass timber: There is Albina Yard, the first office building in the U.S. built with domestically manufactured CLT (LEVER Architecture recently moved its offices to this four-story, 16,000-square-foot building), and L’Angolo Estate, a winery tasting room in Newberg, Oregon. With funding from the National Science Foundation and a $1.8 million grant through the U.S. Tall WoodBuilding Prize, LEVER is implementing a performance-based design process throughout its projects. The grants help pay for additional research costs to demonstrate that CLT high-rise buildings are equivalent to traditional steel construction. LEVER advocates mass timber as a more sustainable way of building while encouraging economic growth in the Pacific Northwest. “We look to the farm-to-table model, where people are connected more directly to the producer,” Robinson said. 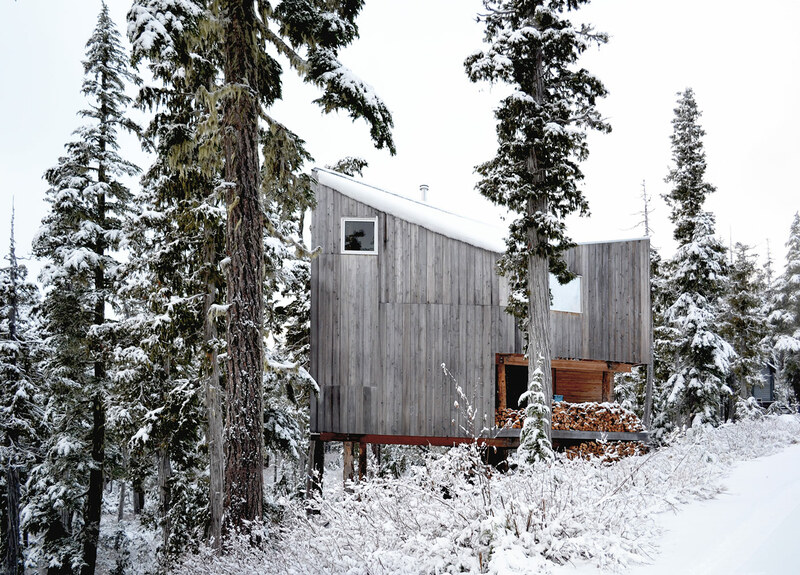 Translated from the culinary scene to the architecture world, the “forest-to-frame” approach is about building stronger relationships between architects, contractors, and the people growing the timber. The Architect’s Newspaper featured the Emerging Voices firms in our February issue; stay tuned as we upload those articles to our website over the coming weeks. 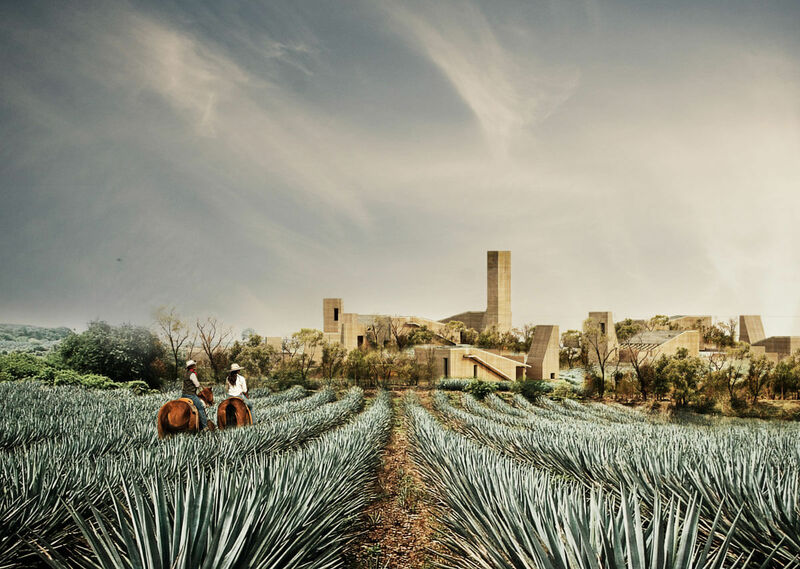 The firm featured below (Mexico City and Barcelona-based Cadaval & Solà-Morales) will deliver their lecture on March 16, 2017, at The Architecture League in New York City. Click here to learn more! Eduardo Cadaval and Clara Solà-Morales met at the Harvard University Graduate School of Design and launched their practice, Cadaval & Solà-Morales, in New York City shortly after in 2003. Two years later, they moved it to Barcelona and Mexico City. Their first projects were two residences: the House at the Pyrenees—a renovation and expansion of a vernacular house perched on the top of a mountain in Aran Valley, Spain—and TDA House in Oaxaca, Mexico, a beach house that can easily be opened and closed depending on the weather. This simple approach has led to striking results: The X House is nestled into the hills of Cabrils, Barcelona, celebrating the expansive, dramatic views of nature and the city. The project also makes use of concrete construction techniques typically used for building bridges and tunnels. To help reduce costs and shorten the construction schedule, the project relied on high-density concrete made using a single-sided formwork rather than a double-sided one. Outside of Spain, Cadaval and Solà-Morales are building up a body of work in and around Mexico City. “Recently we have been working on buildings that are part of an effort to densify Mexico City,” said Cadaval. These include urban residential units, such as Córdoba-Reurbano—a conversion (renovation and addition) of a formerly abandoned historic home to nine residential units with ground-floor commercial space. Cadaval and Solà-Morales, both associate professors at the Barcelona School of Architecture, have also completed ephemeral works, including a Reporters without Borders exhibit at Robert Palace in Barcelona. The Architect’s Newspaper featured the Emerging Voices firms in our February issue; stay tuned as we upload those articles to our website over the coming weeks. The firm featured below (New York City–based Leong Leong) will deliver their lecture on March 9, 2017, at The Architecture League in New York City. Click here to learn more! Dominic and his brother Christopher founded their practice, Leong Leong, in 2009, and although they came from distinct architectural firms—Dominic worked at Bernard Tschumi Architects before founding PARA-Project, while Christopher worked at SHoP and Gluckman Mayner Architects—their shared upbringing equally influences their firm’s approach. “The practice is much more about an organization and a collective of people. Our interest in architecture is a way to embed ourselves in different contexts and to relate to who we are as individuals,” Christopher said. The Architect’s Newspaper featured the Emerging Voices firms in our February issue; stay tuned as we upload those articles to our website over the coming weeks. The firm featured below (Jackson, Mississippi–based Duvall Decker) will deliver their lecture on March 9, 2017, at The Architecture League in New York City. Click here to learn more! 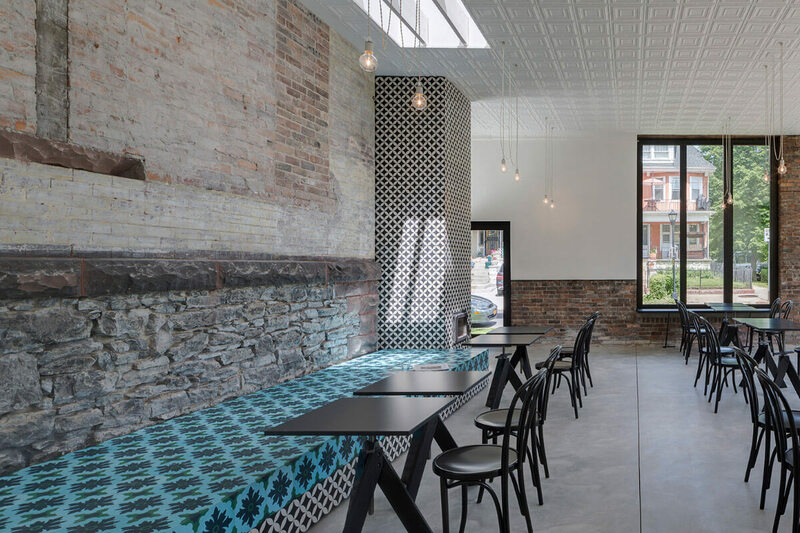 Jackson, Mississippi–based Duvall Decker Architects have a knack for finding design solutions for the complex politics of the underserved urban South. From housing to institutional work, the firm navigates an intricate web of public money, government subsidy, and city code. They have become so good at it that they find that they are teaching their clients, and sometimes city officials, how to get things built while serving the community. An early project, designing a small high school, found them consulting with the client after completion about how to best maintain the new building. When looking for an office space, instead of renting, the firm decided to buy a space. This led to a series of buying, fixing, and reselling their own office spaces, something they jokingly called “office flipping.” In other projects, the firm’s research strategy led them to form master plans, which led to more work. These early experiences shaped the way in which the office now operates. In more recent work, Duvall Decker has been tapped to design entire affordable housing neighborhoods. For a project for the Jackson Housing Authority, planning and community research led the office to some unorthodox formal moves. Hoping to achieve the maximum density, but limited to building duplexes, a twist and shift was applied to the typical typology. The resulting form produced more social interior spaces, and more dynamic exterior spaces, both usually lacking in the standard banal blocks of public housing. Duvall Decker’s attention to the client and the end user is just as evident in its institutional work. Reflecting new ideas about education, and the social topics taught within the project, Bennie G. Thompson Academic & Civil Rights Research Center at Tougaloo College in Jackson, Mississippi, strives to embody egalitarian ideas through form. With no center and a diverse set of spaces, students can inhabit the building in more than one way. When Ann and Roy Decker set out to start an office they did not know exactly what they were getting into. Coming from academia, they wanted to continue teaching, but they felt they could contribute more within the profession. The path from those early days to their now thriving practice was not typical one. Today they are not simply an architecture firm. 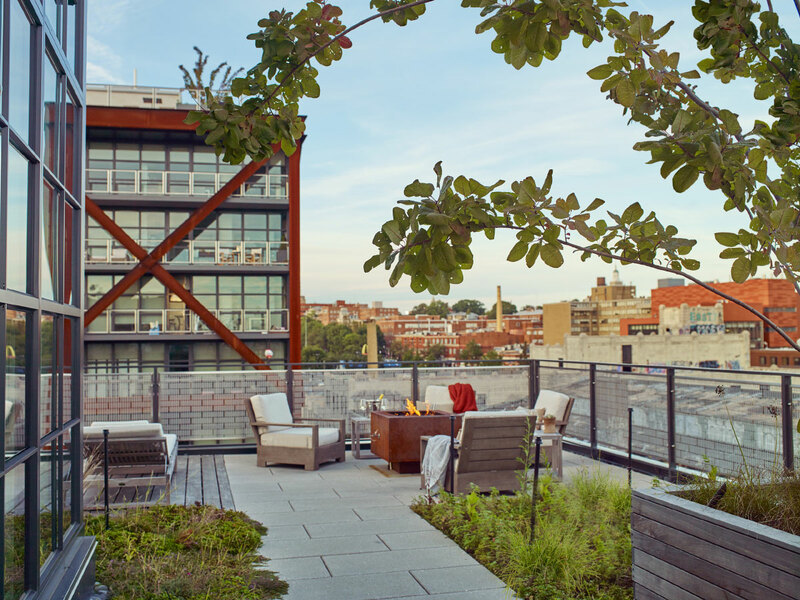 Within the design practice, master planning and consulting play a major role; outside of design, the firm acts as developers and property managers. This journey has given them the chance to continue educating: their clients and themselves.